Three new "Star Trek" perfumes attempt to capture the smells of Capt. Kirk, First Officer Spock and Lt. Uhura. The packaging resembles a "Star Trek" communicator but comes in different colors; here, Uhura's is seen in red and gold. If you ever wondered what Capt. James T. Kirk, First Officer Spock or Lt. Nyota Uhura smelled like while working on the USS Enterprise, check out a new line of fragrances that draws inspiration from the famous "Star Trek" characters. Lifestyle License, under license by CBS Consumer Products, plans to beam up the new smells to the European market. The men's and women's fragrances will come in individual 50-milliliter (1.7 cups) packages starting in June, Lifestyle License said in a statement. Each perfume bottle resembles a "Star Trek" communicator, with the individual character fragrances coming in a color representing the character's uniform. 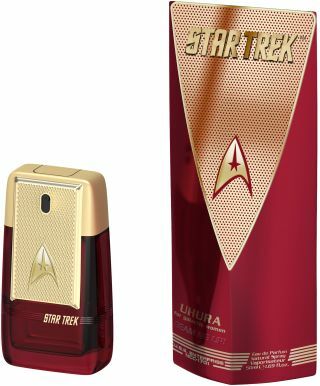 Kirk's fragrance will come in a black package with gold detail; Uhura's will be red with gold detail, and Spock's will be blue with silver detail. Kirk's fragrance is meant to evoke his charisma. It will include bergamot, lavender, apple and grapefruit chords with a heart of lily of the valley, rose, geranium and violet. "This versatile composition is supported by a warm base note created out of tonka, cinnamon, leather, sandalwood and patchouli that completes this intense fragrance experience," Lifestyle License said in the statement. Uhura's fragrance is supposed to represent emancipation, both on the starship and in real life. (Her character inspired many African-Americans, including former NASA astronaut Mae Jemison.) Top notes will be fruity, including bergamot, mango, grapefruit and neroli. The heart is more flowery, with orange blossoms, violet leaves and jasmine. "The combination of cedarwood, musk, amber and sandalwood is used to grant this perfume with Uhura's sensuality and to complete this all in all perfect creation," the statement said. Spock's fragrance reflects his logic and intellect, and includes scents of tangerine, cardamom and pineapple with a heart of lavender, violet leaves and pink pepper. The base note will be patchouli, suede and cedarwood. "Star Trek" celebrated its 50th anniversary as a franchise in 2016, and a new CBS streaming-only series called "Star Trek: Discovery" is in production. A firm release date for the new series has not been announced, but CBS has pegged it for late 2017.